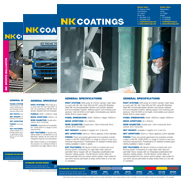 Galvanizing » NK Coatings | The market-leader in metal finishing services in Ireland. Galvanizing is a simple process of corrosion protection consisting of dipping steel into a bath of molten zinc to produce a non-oxidising zinc-iron alloy layer on the surface. It is probably the most economic, efficient and pollution-free process available to protect steel against corrosion. The steel which has been cleaned of grease, paint and other contaminants, is immersed in the molten zinc which has been heated to around 450 degrees centigrade. The zinc reacts with the surface of the steel to form a progressive and highly corrosion-resistant zinc-iron alloy coating. This is metallurgical bonded layer that becomes an integral part of the steel making it extremely resistant to physical damage and rusting. The layers can actually be harder that mild steel, which gives the total coating a very tough and durable finish. The standard galvanize coating can have a typical maintenance free life of up to 50 years in rural areas and up to 25 year in urban/marine areas. The process is completed under the European Standard BS EN ISO 1461. What is the Galvanizing process? Click here to view the process of Galvanizing.